· 2 years ago, 3 floods covered the whole Domain. The wetland, being the lowest part of the Domain, was badly affected and many flax and cabbage trees were partly destroyed, and the area was covered in silt. Well known Kapiti businessman Malcolm Leeming, has been involved with assisting the Life Education Trust for over 21 years. He has served as a Trustee for that time, and has been personally responsible for the raising of over $500,000 in that time to assist the Life Education movement in the greater Kapiti district. The Life Education mobile classroom, is a large truck and trailer unit, which is staffed by qualified teachers delivering educational assistance to primary school students in the greater Kapiti District. The teaching incorporates emphasising the importance of traditional food, harmful effects of drugs, social relationships, self-esteem, and good choices and decisions. 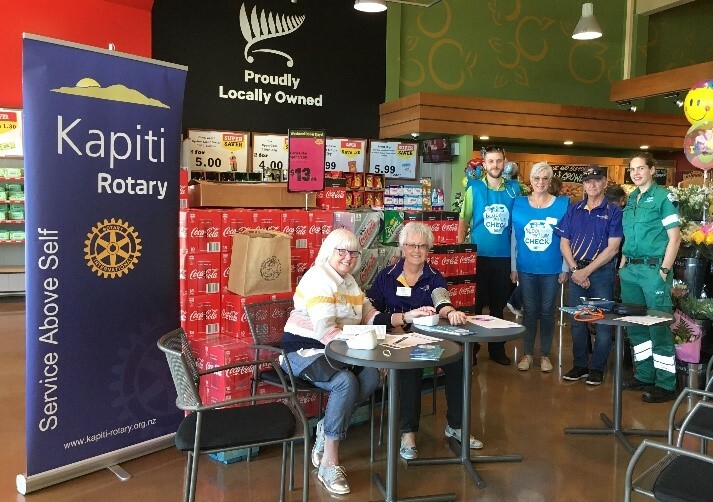 Combined Rotary Clubs in the Kapiti District, originally set up the Life-Education Trust in our territory, and has continued to sponsor and to promote the ideals of this worthy adjunct to routine education. Rotary Clubs will continue with this support. At a recent meeting of the Rotary Club of Kapiti, Mr Leeming was presented with a Paul Harris Sapphire Pin, which is a high Rotary honour, for his outstanding contribution to the Life Education Trust. Photo Caption: Malcolm Leeming (L) receives has Sapphire pin from the President of Kapiti Rotary Mr Chris Tchernegovski. Sun glasses, or eye protection. Gloves, the carex secta is a bit cutty, as well as a few other hazards! Long trousers/slacks again for protection, also protect your arms. Paul Wah shared his thoughts on the current economic and cultural relationship between NZ and China. Paul is a fourth generation Chinese New Zealander and the first Chinese to be appointed as principal of a state secondary school in New Zealand. Paul described our current economic situation, with a significant value of our exports going to China, and the trade surplus being in favour of NZ. He said economically, we are closely related to China. Paul explained how China’s culture has being around for over 4000 years, and has developed key values strongly influenced by Confucius teachings and the Han ethic grouping. These values include having a strong emphasis on family and education. Paul talked of the communist party, and how it is omnipresent in Chinese society. Paul explained the reasons for why the communist party continues to stay in power, and spoke of his views of why Chinese influence in New Zealand is here to stay. 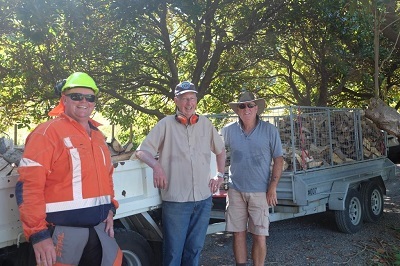 Last week, on a very hot Kapiti Saturday (9/2/19), 19 Rotarians and partners worked to chop and split logs and then delivered 13 big loads of firewood to deserving households in our area. Our efforts mean that these families will be more comfortable in their homes in the winter. The recipients were all very grateful and below is a message received from 1 of them. It is an absolute Godsend to me, and I am stoked. Thanks to all the helpers for the tools, their skills and their labour. Also thanks to Camille for the logs and to Mike Klassen for the use of his wood splitter. All working together for the good of the Community. SIGN UP NOW FOR THIS AMAZING EXPERIENCE !!!! The recent ‘Kapiti Hire’ Golf Tournament organised by the Rotary Club of Kapiti, was the most successful event in this event’s history. 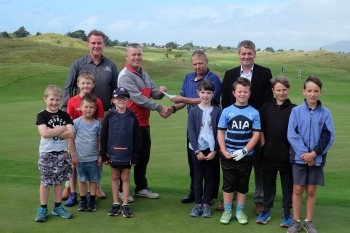 Proceeds raised from the Tournament will benefit Kapiti Youth projects, which include a donation to the Paraparaumu Beach Golf Club for assistance with their Junior Golf Academy. Last year the Kapiti Rotary sponsorship grant was applied to help two promising juniors to enter local and regional tournaments. One of those juniors is Harry Ward currently aged 14 and playing off a 1 handicap. Harry recently shot a 67 in the Club Senior Strokeplay. The following week he won a Wellington schools event with a gross 68. In the words of the Paraparaumu Beach Gold Club’s Men’s Captain, Ray Jones, ‘Harry is a superb golfer and someone to watch for in the future’. The Club Captain is contemplating taking some of the Club’s promising young players to a national event, and some of the Kapiti Rotary grant will be applied towards offsetting the associated costs. Photo Caption: From rear; L-R Leo Barber PBGC General Manager; Glen Robinson, Club Coach, receiving a cheque from Kapiti Rotary President Chris Tchernegovski; and Tim Mikkelsen, proprietor of Kapiti Hire, the principal sponsors of the Golf Tournament, and a group of keen 8 year olds, who are being coached for the future. I would like to take this opportunity to welcome you to the website for the Rotary Club of Kapiti, a strong and vibrant club that upholds the Rotary ideal of “Service Above Self”. We are a diverse group of people who enjoy each other’s company, both socially and while carrying out the various projects we undertake. As a volunteer organisation we are involved in many activities either raising funds, or providing support to projects both locally and internationally, which include supporting for Kapiti youth, aid in the Pacific and the fight to end polio. For me Rotary is a great way to be involved in the local community, while meeting other like-minded people, making friends, and knowing that we make a difference. If this is of interest to you do not hesitate to contact us today, and come along and make new friends and be involved in your community also. Gordon Bell of Paraparaumu is this year's winner of the annual Trailer Raffle with ticket number 1207, conducted by the Rotary Club of Kapiti. The prize consists of the trailer, plus two junior bicycles, a TV set, and a large quantity of grocery items. Total value is around $5000, and the surplus proceeds after costs amounting to approximately $8,500 will be distributed to local Kapiti youth charities. Organisers of the raffle, Tim Mikkelsen and Murray Lobb, both members and past presidents of Kapiti Rotary, commented that "this has been our most successful raffle to date and we will continue with this project because it carries a great deal of appeal to those who participate, and provides funds for assisting youth projects in Kapiti". Mr Bell has lived in the Kapiti District for over 20 years, and is delighted with his win. "The trailer itself is a wonderful prize let alone the bikes, television, and food items. This is the first time in my life that I have ever won anything" said Mr Bell on receiving the prize from Kapiti Rotary President Chris Tchernegovski. 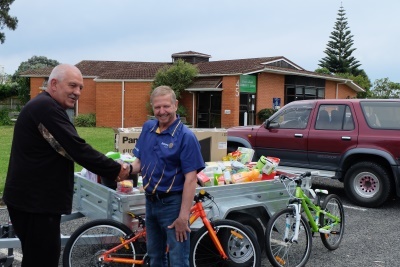 Photo Caption: Chris Tchernegovski(Rt), President of Kapiti Rotary, congratulates Gordon Bell on being this year's winner of the Kapiti Rotary Trailer Raffle. Josie had her audience all abuzz with her tale of becoming a bee keeper, also know as insect keepers! Bees use their honeycomb cells to raise their babies in, and to store nectar, honey, pollen, and water. Josie explained the process of honey production. There are 5 products from a hive: honey, beeswax, pollen, propolis, and royal jelly. Josie talked about the components of a hive, and displayed the different types of ive frames available. Being a beekeeper is an all year job, and its especially busy when they get the bees reqady for the manuka season when the trees are flowering. Kapiti Rotarians participated in the Big Blood Pressure Check on Saturday, 6 October, where they were involved in checking the Blood Pressures of 136 people. 18 of these were referred to their GPs for follow up as their readings were in the higher than normal range. Caption: The morning team of volunteers. We received very positive feedback from the volunteers and participants (and non-participants too – many of whom had only recently been for BP checks). 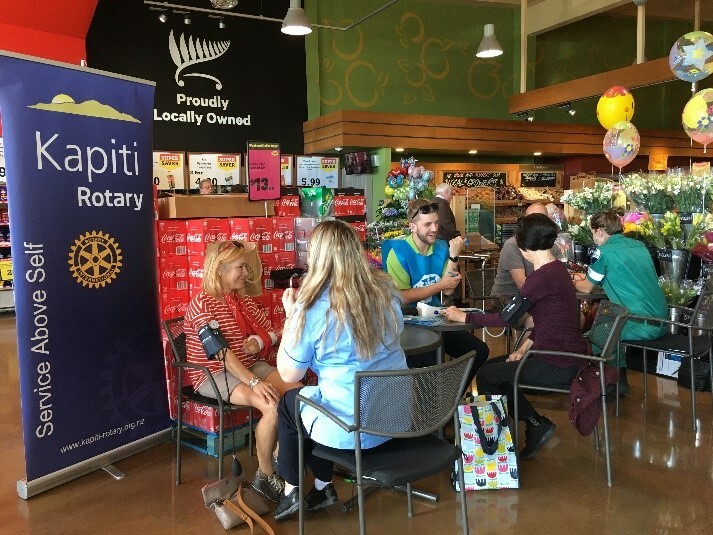 Thanks to Kapiti New World for advertising the event and providing the testing site in their cafe, WFA paramedic Roberta, trainee paramedic Daniel, 2 trainee nurses and nurse Dianne Boyce for taking the Blood Pressures and to the Kapiti Rotarians for their enthusiastic rounding up of participants. Caption: Full house with 3 participants having their BPs checked. Rod Babcock- Electric airliners – the NZ contribution. Dr Rod Babcock works for the Robinson Research Institute, an applied science and engineering research organization. The Institute is famous for its inventions including developing high temperature superconductivity applications. Rod explained the current big problem for the aviation industry is its contribution to greenhouse gas emissions. Air travel is growing exponentially. There needs to be a significant improvement in fuel efficiency in aircraft engines if NZ is to meet its climate change target. One solution is the development of a new type of plane called a hybrid turbo- electric aircraft. There is significant international research and investment in electrified air transport. As normal electric motors are too heavy, superconducting motors are the only means to build an electric airliner. The institute’s expertise in superconductivity means it is heavily involved in the design of a superconducting draft motor. Photo Caption: President Chris thanks Rod Babcock for his presentation. A fascinating update provided by Kapiti Youth Support tutor Darcy Hata, had the Kapiti Rotary Club and guests very interested with the excellent results that they are achieving by putting local youth onto the right track in life. Rotary has had a long-standing relationship with Youthquest when it was established 11 years ago. 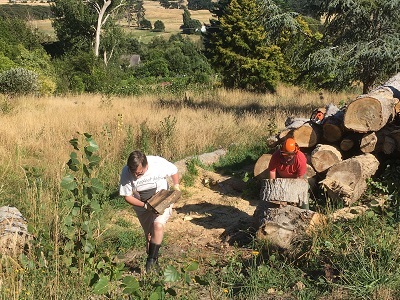 Some of the original funding came from the JR McKenzie Trust, and several Kapiti Rotary members have taken a very active part with it’s development. Unfortunately, Youthquest lost a significant part of its funding and had to close its doors, and has subsequently merged with Kapiti Youth Support, and the good work together with qualified key personnel, has been successfully integrated into the KYS environment. They have now expanded their activities from solely dealing with teenage boys, and now include primary schools thorough using a different programme. During the evening with the Rotary Club, Mr John Dow (organiser of the Gold Wards) complimented the KYS staff on it’s outstanding results in Kapiti. He explained that Regional Gold Awards are presented each year at Presentation Functions whereby all Finalists from their City receive a Certificate, and then further functions are held to re-present the Category Winner Trophies, plus everyone gets a photo with their Mayor. Wellington and Hutt City have most the most businesses involved each year. This year we had a finalist from Kapiti, in TOMM which is a health and welfare service for young people developed by Kapiti Youth Support (KYS) and the digital agency Luvly. To add to the proceedings, the President of Kapiti Rotary Mr Chris Tchernegovski, then presented a cheque for $10,000 to the KYS representatives as further funding towards their excellent endeavours. He also added, that continuing Rotary Club interest will be accorded to KYS, and that funds from our Trailer raffle; golf tournament and other activities will be considered for future assistance. One of New Zealand’s longest ever serving parliamentarians, Peter Dunne, recently addressed the Kapiti Rotary Club. The Hon Peter Dunne served as a busy politician for over 33 years, and retired from Parliament in April 2017. During his time as a politician he served as a Cabinet Minister or Associate Minister for both Labour and National led governments, and held 11 different portfolios. In 1995 he became an independent along with some members of both Labour and National, and formed the United NZ Party which later became the United Future Party. In due course he became the Party leader. His time with the Kapiti Rotary Club was mainly devoted to explaining his working with the eight Prime Ministers that had led the New Zealand Government during his 33 years. Some very amusing anecdotes were recounted, which had the audience highly interested and eager to hear more. At question time, he was asked his opinion on who was the best Prime Minister he had worked with. His response was, that all of the eight worked extremely hard for the benefit of the country, and it is difficult to rank them, because each of them held strengths in different form. He did go on to mention the ability of John Key as a very capable Chairman and economist, and Helen Clark as a very clever politician and negotiator. He regretted the fact that Bill English was not enabled to realise the plans and policies he had outlined prior to the last election. In thanking the Hon. Peter Dunne for an outstanding address, Dr. Ken Milne of the Kapiti Rotary Club congratulated him for the informative insight into the life and trials of a New Zealand politician. Photo Caption: Kapiti Rotary President Chris Tchernegovski (Left), and Dr Ken Milne congratulate Hon. Peter Dunne (Centre), on a most outstanding and informative address. Mr Paul Atkins, Chief Executive of the well-known Zealandia Bird Sanctuary recently visited with the Kapiti Rotary Club, and presented facts about the preservation of wild-life in and about Wellington that interested a large audience. Many species of native birds including Tui; Kakapo; HiHi; Korimako; Kaka and Fantail, have been provided with a predator-free safe haven within a fenced valley, in which to breed and live naturally. This has had the effect of bringing bird-life back into the surrounding suburbian gardens, and residents can once again enjoy the benefits of watching and listening to the attractive calls of native birds in their own surroundings. 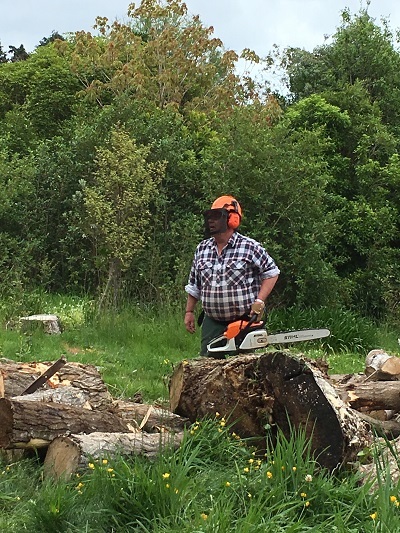 Zealandia staff have been actively involved in the encouragement of a predator-free Wellington. Rats, opossums, and stoats have now been eradicated from the suburb of Miramar. There is an initiative to give priority to bringing about a Wellington that can boast being the ‘world’s first pest-free capital’. Zealandia attracted almost 73,000 visitors in the past 12 months, and these included 4,600 cruise-ship passengers from all over the world. Comments relayed to staff have been very complimentary, and many overseas organisations have expressed intentions to emulate the wild-life preservation example that has been set in Wellington. When asked about the future, Mr Atkins replied that ‘Zealandia is leading a transformational change in the way people think about the value of nature, and learn how to nurture and live with it in the places we live’. 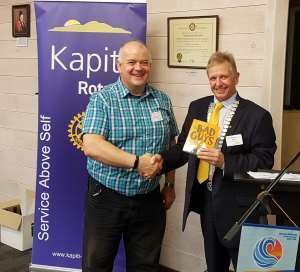 Photo: “Paul Atkins Left), CEO of Zealandia Wildlife Park is congratulated by Rotarian Tim Beere (Right) on his outstanding address to Kapiti Rotary. John spoke about the settlement of Pitcairn island, which was initially settled by the mutineers of the Bounty. John's descendants came from the Isle of Man so he is probably related to Fletcher Christian. John wove a story of great adventures, sailing ships, mutineers, brave men in small boats, dastardly and wicked deeds, beautiful women, deserted islands, faulty maps and postal stamps. For more information his presentation is here. Kapiti Rotary (in conjunction with WFA) has now completed its 5th installation of an AED (automated external defibrillator). It is on the Coast Community Church building in Hinemoa Street. 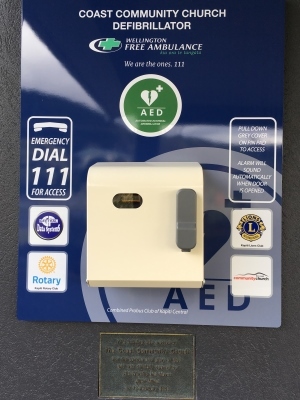 Visitors to the Church, local residents and businesses in the northern end of the Hinemoa Street area will now have fast access to an AED if someone has a cardiac event. Donors for this site were Kapiti Rotary, Coast Community Church, Geethal Data Systems, Kapiti Lions and the Combined Probus club of Kapiti Central. A dedication/unveilling ceremony for all interested groups will be held at a date to be advised. 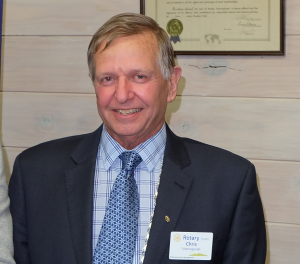 His Excellency Peter Woolcott, Australian High Commissioner to New Zealand visited with the Kapiti Rotary Club recently, and surprised the audience by announcing that he will be returning to Canberra shortly as Chief of Staff for the Turnbull Government. The Commissioner presented an outstanding address regarding the special arrangements that exist between Australia and New Zealand, particularly relative to economic issues, trade, and security. In the relatively short term of his position here, he has developed a deep fondness for New Zealand, and admires the magnificent scenery. He is equally impressed with the race-relations situation, and the overall friendliness of New Zealanders. He sees New Zealand as a very confident country, with a buoyant economy, and is equally impressed by the manner in which we weathered the world-wide financial crisis through excellent economic guidance and foresight. New Zealand and Australian governments have regular and meaningful meetings to manage the largest combined economic relationship at this time. These meetings also comprise methods for a working methodology on a host of matters, with a strong emphasis towards national security, and intelligence issues. Both nations have proactive roles in shaping our futures together, and do work together as trusted partners. We take into consideration humanitarian disasters, where we help each other in such as the Christchurch earthquake, and the Ash Wednesday fires as examples. ‘Both nations have so much in common that we are always maintaining awareness for keeping our paths for the future on a similar course. There are 610,000 Kiwis living in Australia, and 65000 Australians living in New Zealand. Tourism between the two nations is huge, and on a combined basis, we present an attractive destination for tourists from around the world. There will always be a friendly rivalry between our countries on the sporting field, but that is healthy. My family and I have thoroughly enjoyed our sojourn in your great country, and take wonderful memories with us back to our homeland’ said the High Commissioner. Photo: Past-President of Kapiti Rotary, Roger Sowry, (r) thanks His Excellency Peter Woolcott for an excellent address and presents a parcel of locally made product for his time and speech.